One of the perennial problems with cannabis use is how long its metabolites stay in the body. This means that even if you are a casual user on the weekends, a drug test during the week could flash positive. Long after the high is over. So, what can you do to avoid the fate of testing positive? Here is our convenient 4-point primer—with a few important pieces of information you also need to know. Don’t smoke or ingest any cannabinoids. Ever. Obviously, number one is an unpalatable option. You are still reading. Here is the second easy alternative. Don’t ingest any cannabinoids at least a week, if not up to three months, before you are tested. How do you know which timeframe applies to you? Here is a rule of thumb to give you at least a ballpark understanding of how long cannabis can stay in your system. If you are an infrequent user, a few puffs of a joint on a weekend will probably be gone from your system in a couple of days. One word of warning, however. Do not drive for at least four hours. THC can stay in your saliva for up to a day. DUI kits now coming into the hands of police will test spit. 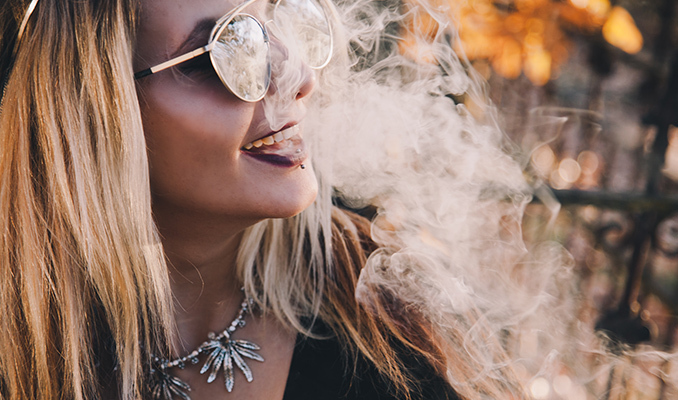 The psychoactive effects of a brief interchange with cannabis, however, will no longer affect you after four to six hours of a light dose (10mg and under). If you smoke every weekend, or regularly nibble a THC-infused edible treat, be warned. Depending on your metabolism, body fat, and gender, THC metabolites can be detected up to 30–60 days from the last time you indulged. If you are a patient or daily rec user, testing is a perennial sticky wicket. Including on the highway. If you use THC every day, seriously consider limiting the amount of driving you do in all jurisdictions where cannabis is now legal for either medical or recreational use. If you cannot rely on public transport (think of all those tons of carbon you could save), see driving suggestions above. Drug testing is a real thing. There are four kinds of drug tests that are widely used. • Urine tests: These are widely used in the US and for employment tests. They are the easiest to fool. If you are looking for options, read on. • Saliva tests: These are increasingly being used by police for road tests. If you are out of it enough to drive stoned, you are also unlikely to have planned to have any gum or mouthwash handy if pulled over. That said, there are products that can ameliorate the impact of THC even here. FYI, this is not a recommendation. Do not drug and drive. • Hair Tests: Your infrequent use will almost never show up here. Heavy users beware. The best way to sidestep this kind of test is to have a wig made. Preferably of your own hair before you started using. If you are this organised, hats off. Pun intended. When to wear it and how to direct the snipping? Another issue fraught with difficulty, if not danger. • Blood tests: Almost impossible to cheat on. Luckily, these are used rarely in any setting, except hospitals. If you end up being forced to take a hospital blood test, beware. Especially because, in Europe at least, it usually means you are there because you were caught by the police. Look on any cannabis-related website, and you will find expensive teas and detoxes. Some of them even work. However, home remedies are also highly effective. Here are a few easy ideas. 1. Try to reschedule the test at least once. This will buy you a couple of days. At least. 2. Flush your system from now until the test. Drink lots and lots of fluids. Water and cranberry juice are the perennial faves. Green tea is also highly recommended. Word to the wise; if your urine is too weak, they may get suspicious and ask for a retest. Try not to have a test scheduled for first thing in the morning. 3. Mix a packet of fruit pectin with your fluids. This is the solidifier used in good old household jelly making. Essentially, the fibre from the pectin discourages THC metabolites from passing into the urine or blood. Be careful though. Too much can cause digestive distress. 4. Exercise. Flushing your system via sweating is highly effective. Just be advised that if you are a heavy user, the exercise process can actually raise the testable THC in your system temporarily. How much? Unfortunately by enough to indicate you have smoked a joint recently. 5. The sauna. Studies have shown that sauna-based sweating is a great way to release fat-based toxins from the body. Study participants included police officers exposed to dangerous chemicals at work. Not advisable for people with existing heart conditions. Also be sure to replenish your fluids afterwards. Coconut water is an excellent idea. 6. Change your diet. Eating a healthy so-called Mediterranean diet with lots of leafy greens is an excellent way to detoxify your body if you have a few days notice. Fruits and veggies are the food of choice. They help get the digestive tract moving, and thus are great in flushing out the system. 7. Premade detox drinks, gum, and other aids. Be warned. Some are more effective than others. Check customer reviews and proceed carefully. These can also break budgets better spent on other things. 8. Substitute fluids and dilution. Usually a bad, if not dangerous idea. Fake penises aside, not to mention practice and body warmth, here is question you need to answer. Is this job or situation really worth this level of deception? Gattaca was a great movie, but can you Ethan Hawke it through your life? 9. Substitute your THC usage for CBD products. This is a good idea if using cannabinoids to achieve a deeper sleep. Or for medical reasons where THC might interfere with other issues. 10. If this will be a long-term, recurring threat (ie. you live in the United States and work), think about employment alternatives, such as a job in the industry. Or a self-employment situation where you do not have to be drug tested.